Piri Reis (full name Hadji Muhiddin Piri Ibn Hadji Mehmed) (about 1465 – 1554 or 1555) was an Ottoman-Turkish admiral and cartographer born between 1465 and 1470 in Gallipoli on the Aegean coast of Turkey. Today, people remember him because of the maps he made. 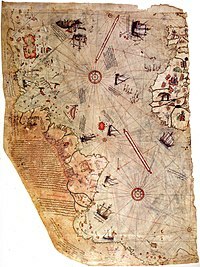 He made the first Ottoman map to show parts of the Americas, the Piri Reis map, in 1513. He drew a second map in 1528. Only a fragment of that map survives today. That fragment however, shows parts of North America, including Greenland. It goes from the coast of Labrador and Newfoundland in the north, to Florida,Cuba and parts of Central America in the south. Therefore, some people believe he drew a map of the Arctic about 200 years before it was discovered. This page was last changed on 16 September 2017, at 08:20.